I LOVE quick and easy snacks! I came across this recipe at Smashed Peas and Carrots and knew I had to give them a try! My whole family enjoyed these, and best of all, they are pretty healthy! 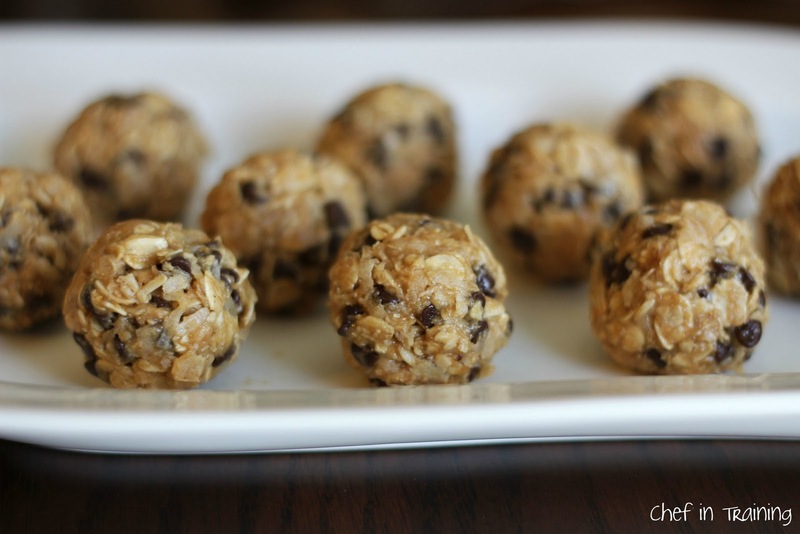 They reminded me of chewy granola bars in a ball form! They were seriously so good! If your are looking for a quick snack to whip up for your kids or yourself, this would be the perfect one! In a medium bowl, combine all ingredients and stir until thoroughly incorporated. Cover with saran wrap and put bowl in fridge and let chill for half an hour. Once chilled, roll into 1 inch balls and enjoy! Yum! I love these little balls! I'm going to make some up today!! Thanks for the recipe! Those sound and look wonderful! Except I really can't stand coconut... would it hold together as well w/o it or any ideas what I should substitute it for? Does anyone know what the nutritional value of these are by any chance? :) My email address is ilovetahsha@gmail.com THANK YOU! I have made these before. They are awesome. Recipe above is missing one important ingredient though: Chocolate Shakeology!! I'm going to try these for my morning snack tomorrow. These look so great, can't wait to make them! I substituted the coconut flakes with crushed up corn flakes and it was DELICIOUS!! my husband and I love these! I make something similar to these for my daughter except they have craisins, carrots, wheat germ, and sunflower seeds and no chocolate chips. I've never really enjoyed them but she eats them up big time. THESE look like something that I would enjoy too! I am SO glad you mentioned Shakeology! 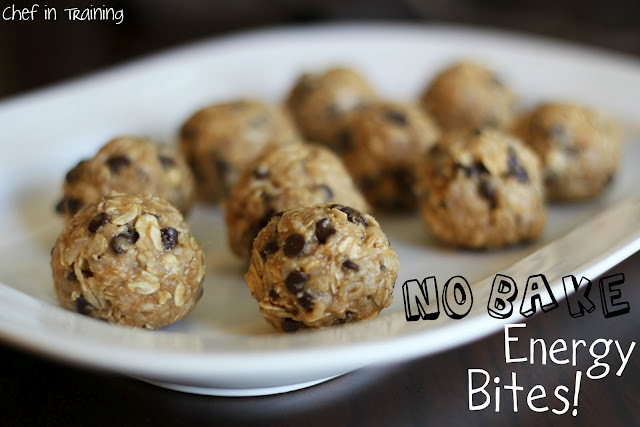 I have a whole bunch sitting around that we haven't been using enough... it made the energy balls SO GOOD! I forgot to pick up peanut butter today. Does anyone think Nutella will work as a substitute? I really want to try it out! Oooh, goodness those look good--like I want to go and make some right now good! I have made these in many different variations. I usually just throw whatever sounds good at the moment in! We just call them trail mix balls. These are awesome to take out hiking..so good and so easy to make! I already copied these down to make today! Thankk you for sharing. Hey Nikki, these look delicious!!! YUM! Thanks for sharing! Love this! I am putting it on my to-do snack list! Thank you! These sound delicious! Perfect to take for a snack to school! Thank you! Can you freeze them for later use? These look so yummy! How do you add carrots? Just shred them up nice and thin? I'd add some rice crispies or crushed cereal of some sort; I think they would be too sticky/gooey without the coconut. I used to have a recipe for energy bites that had skim milk powder, oatmeal, coconut, peanut putter, honey, chocolate chips. I can't remember amounts or other ingredients. It was a great nutritious pick me up. A huge help to a new mom. If you could help I'd appreciate it. TJ, I was going to say the same thing!! I don't care for coconut either and had one of these last night before I knew they had coconut. I couldn't even tell. They were great! These are great! I love themMy sister does not usually care for coconut and she couldnt even tell these had any. Do you use quick oats or old fashioned oats? These look amazing! So glad you enjoyed my recipe! These never last long at our house!! Yum, these look good! Does it matter what type of oats you use, quick or old fashioned? I made these last night for my teenager to take up skiing. What a great recipe. Thanks! These will be made again and again for sure. I wasn't sure what kind of oats to use either so I went with 1 minute oats and the recipe turned out just fine. YA I too would like to know what this shakeology is.... Please someone enlighten us that dont know. I have to go to town today and want to get all the things that i will need, but I have never herd of this. You could add powdered milk. http://www.shakeology.com/ Check it out! I add Shakeology to some of my regular recipes and it is to die for! Literally :) I know some health nuts who use a silken tofu and mix it in w/choc. shakeology to make a healthy pie too. There are so many uses for it! Also, one serving of shakeology is equiv. to 30-40$ worth of produce. Yes, you would have tp eat $30-$40 worth of produce to get the same nutrients! It does wonders for your health, weight, metabolism, and energy. Plus it comes w/ promise of your money back if u decide its not your thing! :) No, I'm not selling it! I just know howwwwww good it is, and happen to believe in it ;-) Hope u try it sometime! Good luck! Just finished making these, so easy and yummy. Thank you! I make these all the time and do not use coconut. My version you put the oats in the blender and blend them just a bit. I also add dried cherries (or you could use raisins). I love to freeze them and eat them partially frozen. Great and easy recipe! I made with crunchy peanut butter and 1/2 chocolate chips and 1/2 butterscotch chips and they are WONDERFUL! Our whole family loves them - thanks for sharing the recipe! I am so thankful for fast, easy, and healthy snacks! I am NOT a cook at all and don't enjoy cooking or eating that much...so I have very little motivation to get into the kitchen. But my husband has to eat...so I really need to do something about it. Thank you for this post! Considering everything that goes to school or daycamp these days MUST be nut free, I decided to sub out the peanut butter for some pureed chickpeas in this recipe. Amazing! No really! You can't even taste them! They held together nicely, and the kids love them! I did up the honey to about a 1/2 a cup though too. Good, but really sweet. I wouldn't add the chocolate next time; some type of dried fruit instead. Recipe makes 24 balls that are about an inch in diameter. Chilling didn't help the texture or stickiness at all. How much protein and carbs and fat are in each 1 inch ball. I'm eating a balance of carbs and protein and these look great. I am going to make these right now. BUT I will be taking out the chocolate chips and putting in raisins instead. i dont like coconut either but i made them anyway.. YUMMMMM. CANT hardly tell its in there. so good you wont notice. what is the calorie count? can i eat the entire bowl at once? Subbed a pre-mixed "Power Blend" for the seeds that also had pumpkin seeds and cinnamon in it. Was delish! !